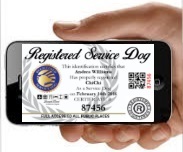 Although not a requirement a Registered Service Dog Certificate will help you with access issues when out with your service dog. The Americans with Disability Act is very clear, you are not required to carry any identification with you to prove your dog is a service dog. The law is very clear, however that does not mean that business owners are clear about the law. Customers have requested that we carry a certificate for years now, finally it is available. Your dog’s appearance, manners and attire such as a vest and identification will help you avoid public doubt and conflict. * LIFETIME REGISTRATION NUMBER LISTED WITHIN OUR DATABASE: our information and registration number will be stored within our secure database until requested by the owner/handler to be removed. NEW - Add an optional electronic certificate by email. Always have your document with you by saving the certificate to your smartphone. * Electronic document will be emailed the day your order ships. Service dogs are specifically trained to help their disabled handler. These dogs are trained (professionally or self-trained) to perform a task for their handler such as, picking up items, guiding the blind, alerting them to medical issues etc. Service dogs have public access rights under the ADA law to enter public property with their disabled handler.